Bailey’s unassuming location along a bend in the road on US Highway 285 belies its role as a gateway to some of Colorado’s best wilderness adventures. The venerable town sprang to life in 1864 when William Bailey established a ranch and stagecoach stop—12 years before Colorado was granted statehood. 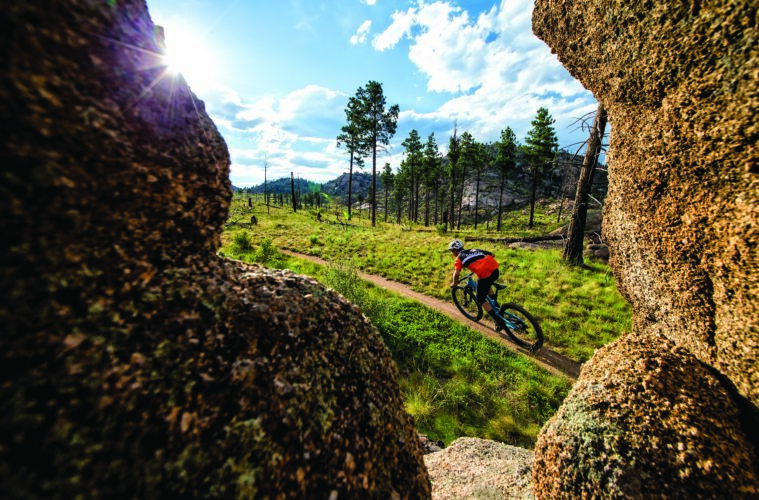 While the history of the area is rich, most people come to Bailey to get outdoors and play in the Buffalo Creek Recreation Area in Pike National Forest. The beginnings of a magical matrix of trails were just coming to life at Buff Creek when the catastrophic Buffalo Creek Fire incinerated over 12,000 acres in 1996. What rose from the ashes has evolved into 60-plus miles of the some of best singletrack mountain biking in the West. While the area was once known primarily for beginner and intermediate singletrack, the 2011 addition of the gnarly Blackjack Trail, intentionally designed to offer legit technical riding along Raspberry Ridge, added some technical challenge. Mountain biking may be king in Bailey, but hikers, campers and backpackers also have plenty to explore. The 486-mile Colorado Trail traverses through Buffalo Creek, with several established campgrounds for both backcountry stays and car camping. And among the summit hikes within striking distance of Bailey sit two unheralded but gorgeous 13,000-foot summits: 13,07-foot Whale Peak and 13,575-foot Rosalie Peak. Finally, anglers have in-town access to Scott McGraw Memorial Park and the north fork of the South Platte River, known for brown and rainbow trout. The majority of the Buffalo Creek area trails are sweet, sweet, singletrack that’s fun for casual riders as well as hardcores. Descents are fast and curvy as they blaze through the apocalyptically charred burn zones and into vanilla-scented pine forests, where welcome pockets of shade and lazy creeks await. Charlie’s Cutoff (one of the oldest trails at Buff Creek), Shinglemill, and Morrison Creek provide some of the best descents, while the steady rhythm of the Colorado Trail from the Rolling Creek Trailhead is a great way to access the larger network. Sustained climbs balance out the equation. In 2017, crews reworked the 2.9-mile Bald Mountain Trail into a buttery ascent, offering a pleasant grind through bulbous rock formations. The 5.2-mile Nice Kitty Trail presents a challenging intermediate climb with a few brief sections of slick-rock-like step ups in the midst of steep-but-rideable switchbacks. And for advanced riders, the aforementioned Blackjack Trail offers a series of casino-themed obstacles that include gutsy rolloffs and demanding technical rock drops. Linking together these and other trails in the system is what makes Buff Creek such a fun place to ride. The trails are multi-directional and even on busy weekends, the crowds disperse, leaving little bike traffic to contend with. There are several trailheads—some, like Miller Gulch, offer free dispersed camping—that prove ideal for point-to-point rides. Late summer and autumn can offer ideal conditions, especially if a little rain has made the singletrack a touch tacky. To learn more about specific trails, check out Mountain Bike Project’s Buffalo Creek page (mtbproject.com/directory/8011430/buffalo-creek-trail-system). The 9.6-mile stretch of the Colorado Trail known as Segment 2 traverses through Buff Creek. As the CT crosses through the burn zones, shade and water are in scarce supply. Spring, autumn and even early winter are great times to see all the beauty of the slowly recovering burn-zone flora and you’ll find plenty of camping spots for overnights. In the heat of the summer sun, escaping to higher altitudes (and possibly tromping through lingering snow fields) is the best way to beat the heat. Hall Valley Campground and the Gibson Lake Trailhead offer access to 13,078-foot Whale Peak (bit.ly/2zpfJ6F), an excellent 6.6-mile, class 2 hike that shares the Gibson Lake Trail to treeline, then requires an easy off-trail scramble along broad slopes to its lightly visited summit. Start about 30 minutes from Bailey at the Deer Creek Trailhead on Tanglewood Creek to climb 13,575-foot Rosalie Peak (bit.ly/2KL9Aa5). The recently renovated trail offers an easy but long 10.5-mile out-and-back to Colorado’s 207th highest mountain. En route, you’ll pass twisted patches of bristlecone pine, some of which may be more than 2,000 years old. Most people who stay overnight camp at one of the campgrounds at Buffalo Creek. Dispersed camping is free at designated sites such as Miller Gulch and along the CT and there is paid camping with facilities at the Buffalo Campground and Meadows Group Campground. Those looking for a lodge with Wi-Fi and hot showers, check out Lynwood Park (lynwoodparkbailey.com) or Bailey View Cabin (baileyviewcabin.com), both reasonably-priced, rustic and comfortable. At Rustic Station (rusticstationrestaurant.com), mountain bike jerseys hang on the wall next to taxidermied animal heads. The classic American food is perfect after a long ride and there are plenty of good vegetarian options. The Cut Throat Cafe (cutthroatcafebailey.com) plates pub food and a relaxed vibe. And finally, China Village has excellent Asian cuisine and friendly service—maybe a bit unexpected in a Colorado ranch town, but a worthy spot to grab a bite.